We had some back and forth discussion, but to be fair he put his calculations out in public so I could dissect them. It seems only fair that I do the same. I'm not going to use the original script or parameters that I prepared for the previous post because the script was a bit ugly and the scenario of saving from zero invested was particularly aimed at demonstrating the impact of the bond allocation. Instead, I'll use the numbers indicated in the thread. So if you are starting with $430,000 and saving $12,345 per month or $148,140 per year and attempting to get to a target savings amount of $1,172,000 this analysis is for you. OK I know what you're thinking -- who does that apply to? Well it's not outside of the range of people who pursue FI and more importantly, it's not a case I came up with so you know I'm not picking numbers to demonstrate my point. Before discussing the results, I do feel compelled to point out that given this scenario you could put all your investments into a money market account and save for 5 years and be just shy of the target. So when you look at the numbers keep that in mind. Of course, once you reached that target you'd likely need to invest it to meet the 4 percent rule or whatever other study inspired your savings target. So that wouldn't get you out of the sequence of return risk but it would give you extreme certainty about when you would reach your savings target. For exhaustive information about safe withdraw rates, go over to EarlyRetirementNow.com. The original post put forward another criteria that we ended up glossing over. The way to have the most certainty is to roll everything into something protected from inflation but that is basically cash. That is not what a total bond market fund is. Bond market funds lose value. There is no certainty with the market. If you keep market exposure you risk extending the date you meet your target. Most people need time in the market to get to their goal. The scenario built here does not require that. The formulation of the bond tent is different than I would have made it as well. You start with a 90% stock allocation until you reach half your target amount. Then you allocate the money beyond that threshold to 75% bonds and 25% stock. My formulation in the previous post was essentially to buy bonds as late as possible as you approached a savings target. Turns out, when I use these numbers, I still see using bonds delay the expected retirement date and the bond tent under performs both the stock only and the static bond allocation in most scenarios (cohorts). That's not to say it under performs in all scenarios. 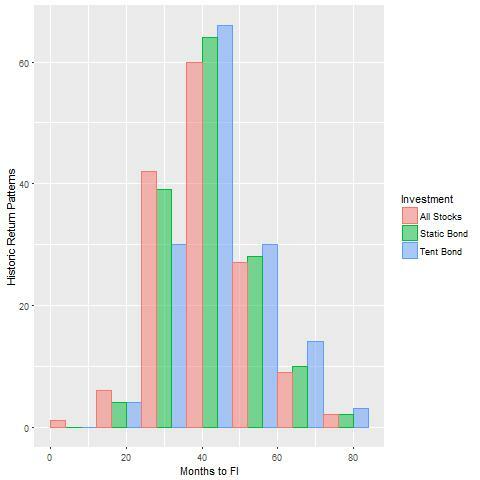 Using the bond tent in one particular scenario allowed you to retire 14 months sooner than the all stock portfolio. But in another scenario you retire 47 months after you would have in the stock only portfolio. That particular scenario starts with the historic returns from 1955. Hopefully if you're reading this, you've gone through the previous post and understand what that means. The graph shows the overall shift you would expect to see. The risk is asymmetric. Using bonds may reduce the date you reach your savings target in some cases, but it also extends that date in many cases. And it doesn't avoid the "bad" cases. In the stock only portfolio the longest time before you hit your target is 78 months. In the static bond portfolio it is the same, you're still waiting 78 months in the worst case scenario. With a bond tent, the worst case scenario is 80 months. So here is the R script I used to calculate the difference between a static bond allocation, a reddit-style bond tent, and a stock only portfolio: Google Drive link. I make no guarantees about the accuracy of the results. I can say that if someone makes me aware of an error, I will post it on this page along with the mea culpa. The data in the CSV is from the EarlyRetirementNow.com website, so it's likely much more trustworthy than anything I would pull together.